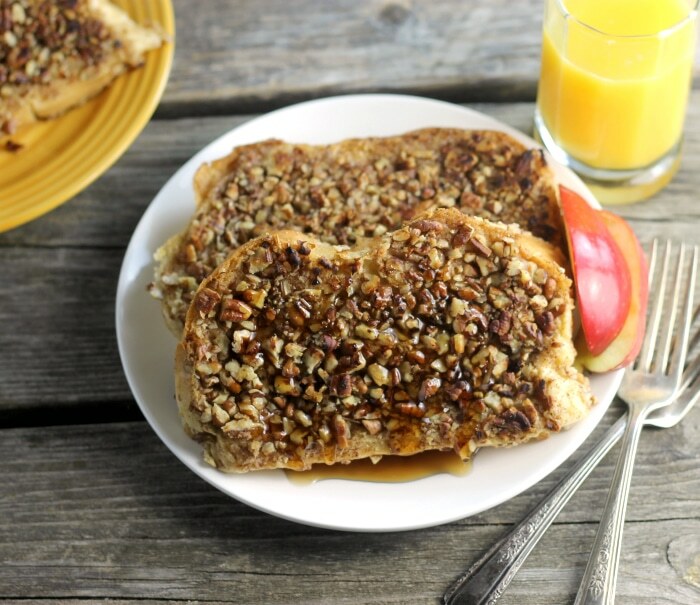 Pecan French toast is so delicious you will swear that you are eating a pecan cinnamon roll. Breakfast will always be my favorite meal, hands down. It’s usually one of the first things I think of when I wake up in the morning. No kidding. 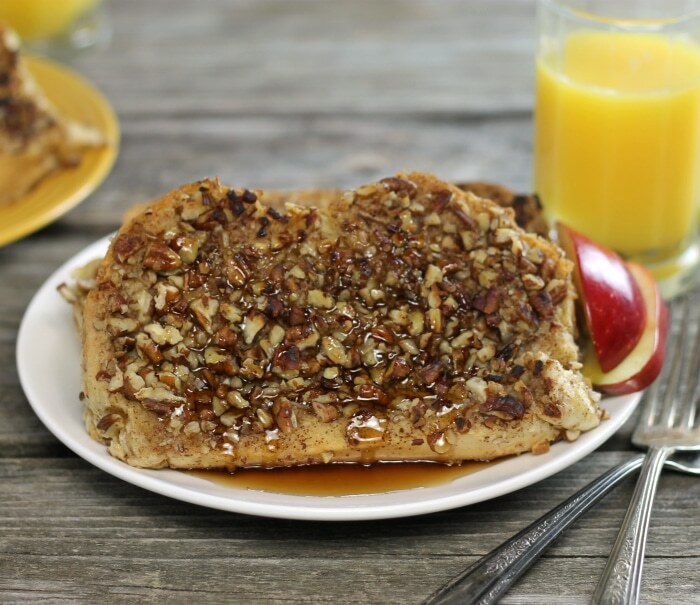 At the top of the list starting now and forever is pecan French toast. French toast, on the other hand, was not a breakfast food that was on the menu when I was a kid. It wasn’t until I met Mike that I really started eating French toast. But I have to say these days I am a big fan of French toast. Thank you, Mike. It seems that my best ideas come on those nights that I can’t sleep. You know when you have a million things swirling around in your brain. That is what happened with this pecan French toast. One night I laid there just thinking of French toast and pecan… yep, that is where it all happened. My one concern with this recipe was that the pecan would not stay on the French toast, but I was amazed how well they stayed in place. The whole thing may look like it will be hard to assemble, but no worries the recipe works really well. As Mike and I ate this pecan French toast all I could think was wow it tastes like a pecan roll. And if you ever have pecan rolls you know how time-consuming that whole thing is. This is a great way to go if you love pecan rolls and don’t have the time to make them. Now I have to mention that it was a really long Christmas break, a lot longer than what I anticipated. But I want to let you know that it feels good to back. I have been working on different recipes on my time off and I can’t wait to share them with you. I hope you will stop in to take a look at these upcoming recipes. Finely Chop the pecans, a mini food processor works well and place in a shallow bowl. Add the eggs and milk in a shallow bowl and whisk together. Add the brown sugar, vanilla, and cinnamon and whisk until well mixed. Heat skillet over medium heat. Melt a tablespoon of butter for each batch of French toast. Dip slices of bread into the egg mixture on at a time. Let the excess of egg mixture drip off. Place the egg coated bread into the chopped pecans. Press light until the pecans have coated the bread. Turn the bread over and repeat. Place the bread into the heated skillet and cook until the edges of the French toast is crisp and the toast is lightly browned. Flip and repeat. Make sure not to overcrowd the pan with French toast, so it cooks evenly. 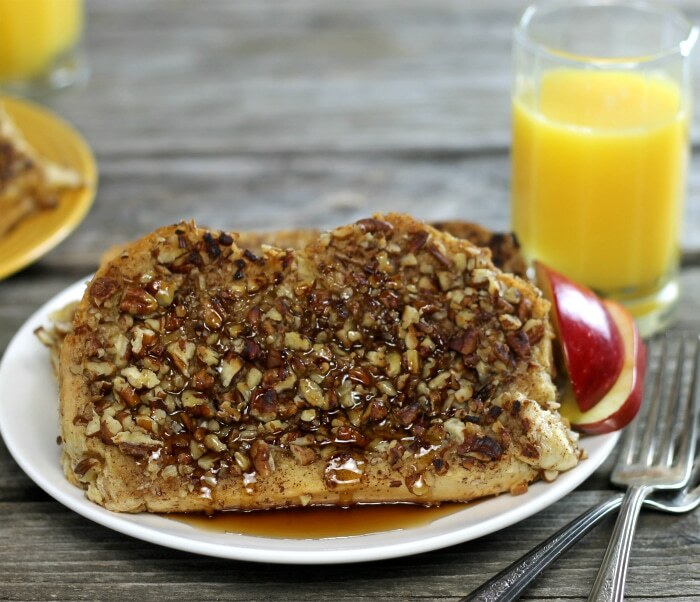 If you like this Pecan Crusted French Toast recipe you may like this recipe as well. That pecan crust looks utterly delicious! OMG. Just when I thought breakfast didn’t get any better than good ol’ french toast, you go and take it to the next level. I can smell it already! 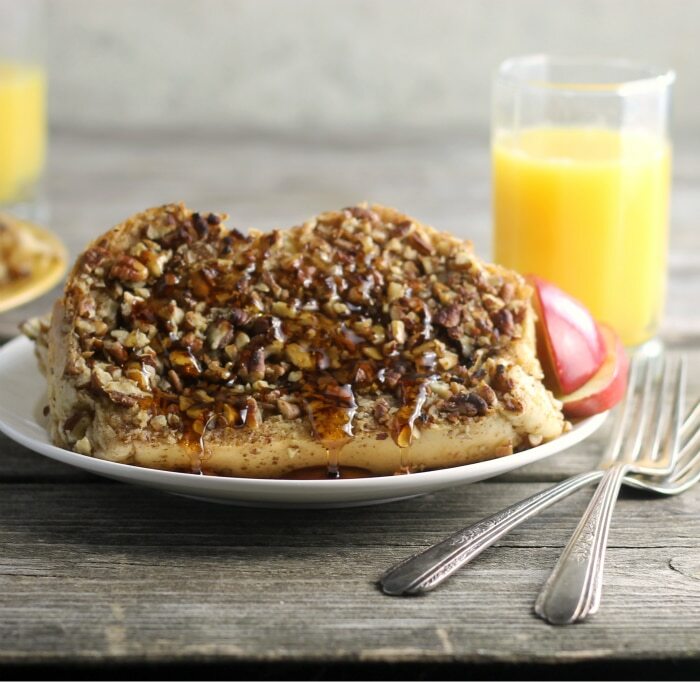 Now, I will be going to bed dreaming of this pecan crusted French toast!! I love sticky pecan rolls, but Bill likes cinnamon rolls—no nuts, no gooey caramel. Sigh. I think I may have to make a third of this recipe just for me!! Wow. Looks amazing. Glad the pecans stayed on. I’m like that every night – as soon as it’s time to fall asleep my mind goes into overdrive. I love French toast – this looks delicious!